Set up a course by joining sections of track together (for your first race use the starter track 'The Nutcracker'). The tracks are always set up with the yellow flags on the left and the red flags on the right. A course can get pretty big so get a big table! Alternatively, you can add and remove track as necessary during a race. Add the start and finish sections to the track. The start section is placed so 1st position lines up with the inside of the first corner (it is double-sided). Each player chooses a color and takes the appropriate sled token, sled mat, brake marker and Dog Decks in their color. Each player places their sled mat in front of them. The brake marker is set at the number "3" (the dogs also start at 3, but this is pre-printed on the sled mat). The dent cards are placed in a pile to the side. 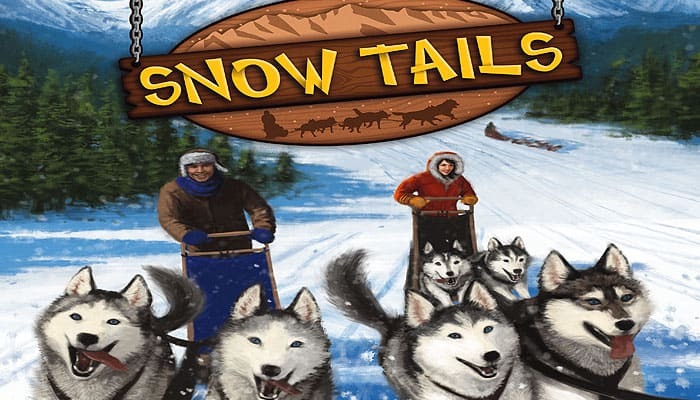 Each player shuffles their Dog Deck and places it face down beside their sled as a draw pile. The player with the huskiest voice is the starting player. The player with the next huskiest voice is second, and so on. Wizened old gamers may decide order randomly. 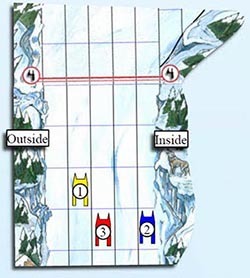 The starting player chooses any free starting position for their sled on the start section and places their sled. In order, the others players do the same. Each starting space can only take one sled. Each player then draws a starting hand of 5 cards. A player starting in the 4th place takes 1 extra card. A player starting in the 5th place takes two extra cards. 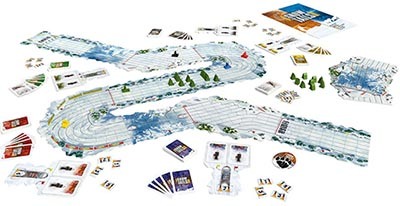 (Note - the bonus depends on the starting space of the sled and is not dependent on the number of players). The game is now ready to start. Players take their turn in race position order (1st, 2nd, 3rd and so on) until everyone has moved. 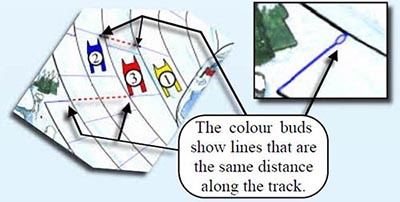 If sleds are side by side then the sled (a) on the inside of a corner section of track or (b) the inside of a straight as it approaches a corner is deemed to be in ahead. On the final straight(s), the inside is taken to be on the same side as the chequered flag on the finish line. Yellow is alone out in front and is first. Red and blue are level, but blue is on the same side as the inside for the next corner. This means blue is second and red is third. On corners, there are guides to help show lines that are the same distance along the track but not next to one another. The color bud at the end of one line corresponds with the color bud of another line at the same level. Here yellow and blue are level, but yellow is ahead as he is on the inside. Red is furthest back. 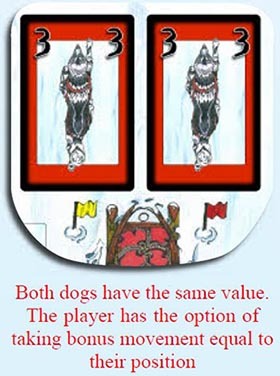 A player must play at least one Canine Card on their turn A player can play 1, 2 or 3 Canine Cards Each card played must be of the same value (e.g. 5, 3-3, 4-4-4, etc). 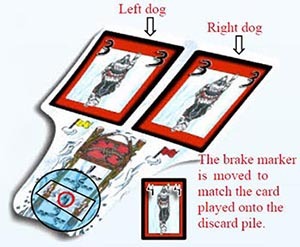 The cards are played face up onto the left dog and/or right dog (on top of any previously played cards) and/or onto the discard pile to move the brake. Each position can only have one card played on it per turn. A card can be played on top of another card of the same value (although the existing card would have to have been played on a previous turn). 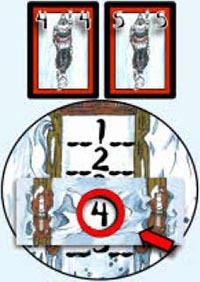 If a card is played onto the discard pile then the brake marker on the sled mat is moved to the same number (e.g. playing a 2 causes the brake marker to be moved to 2). The sled's Speed is the value of the 2 Canine Cards added together minus the current brake value. 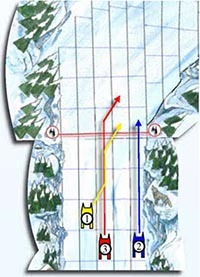 The sled is initially set up at speed 3 (3+3 - brake(3) = 3). 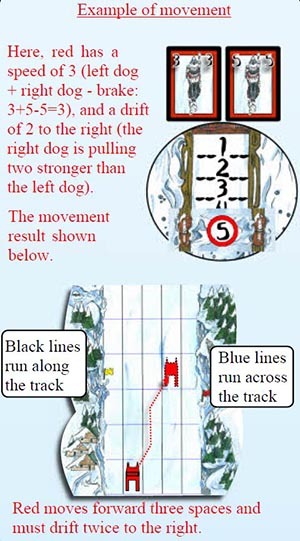 Drift movement (or just "drifting") of the sled is the difference between the pulling power of the 2 dogs. Drifting is a diagonal forward movement. The sled drifts towards the dog pulling hardest. (e.g. 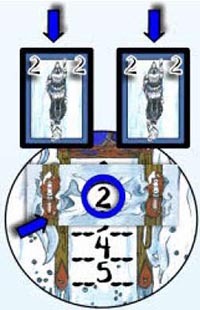 a sled with Canine Cards of 3-5 would cause a drift 2 to the right). The brake value has no effect on drift. Drifting always causes a player's sled to cross a black track line. The player moves their sled forward the number of squares equal to their speed (all movement must be used unless a collision occurs). While moving, they must also drift to the side of the strongest dog (highest value). They must drift a number of times equal to the drift number. If the drift is higher than the speed, then the excess drift is ignored. A sled with speed 0 or less does not move. The flags on the sled mat are simply there to help players orientate their left and right during play. The sled mat can also be rotated to help. 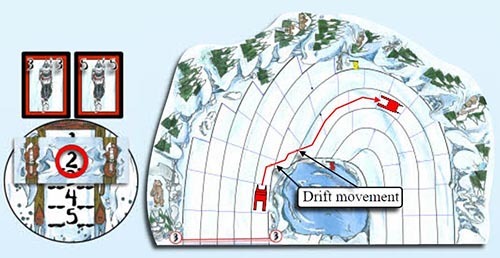 A player is completely free to choose when drifting occurs to their sled. For instance, with a speed of 5 and a drift of 2 to the left they could choose to drift move once, move forward once, drift move again and then move forward twice. However, they must attempt to use all of the drift on their turn (if a player needs to drift twice in their turn then the latest they could start to drift is when taking their second last movement). If the two dogs have the same number on them, then no drift occurs. The sled is considered balanced. Balanced sleds have the option of bonus movement. The sled may take damage as a result of its movement. The player now returns their hand size to 5 cards. If the player has less than 5 cards (including dent cards) they draw cards from their Dog Deck until they have a hand size of five. In some cases, a player may have more than 5 cards (e.g. 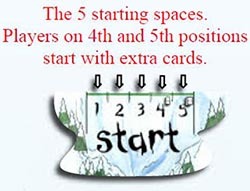 the first turn for a player starting in 5th position, or as a result of picking up a large number of dent cards). In this case a player must discard Canine Cards down to a hand size of 5. These are discarded (not played). They have no effect on the brake marker on the sled mat. Dent cards count towards hand size (as the sled gets beaten up it becomes more difficult to control). Dent cards can never be discarded. If a player's Dog Deck runs out, shuffle the discard pile together with all of the player's used Canine Cards (the top two cards on the sled mat are still active and remain on the mat) to make up a new Dog Deck. This is placed face down beside the sled mat. The player then draws as normal. A balanced sled is a happy sled. Imagine the dogs are in complete harmony. Your sled is being pulled directly forward for a change. See fig. 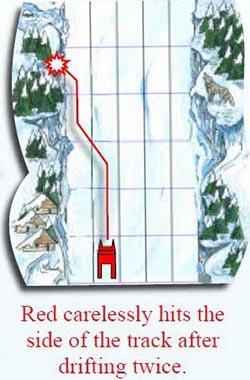 right You are in complete control....this allows you the time to aim for the best routes in the snow or to travel in the tracks left by previous sleds. You get the option of a bonus! Your sled is balanced when each dog has the same value of Canine Card (e.g. 3-3). This means they are pulling at the same speed. A balanced sled qualifies for an optional bonus movement A balanced sled receives a bonus to its speed equal to the sleds position in the race (e.g. a sled in 3rd position would receive a bonus of +3). Bonus movement is taken at the end of a sled's normal movement. It is always taken as forward movement in a straight line. Drifting is not allowed when taking bonus movement. A player must decide whether to take all or none of the bonus - it cannot be partially taken. The bonus is added to the sled's speed. Entering a corner may prove hazardous ! The sled must have a speed of one or more to receive the bonus. This bonus is not used in the first turn of a race (when leaving the start line) as the sleds are just getting up to racing speed. Read this again - you will forget. Sled racing is a dangerous sport. Despite extensive training and safety precautions accidents still occur. Since the local hospital wing only has 1 copy of monopoly for patients to play, we presume you do not want to spend too much time there. As the race progresses, a player's sled may take bangs and scrapes. This makes it harder to control in the future. Players may have to draw dent cards. These will limit the number of Canine Cards they have available to play in the future. There are old sled racers and bold sled racers but no old, bold sled racers. Over 217 playtesters were severely injured in establishing the safe speed limits for corners. Some did not make it past the first corner. Ignore the speed limits at your peril. Ah, forget it.....sometimes you just have to go for it! The player completes the rest of their movement. 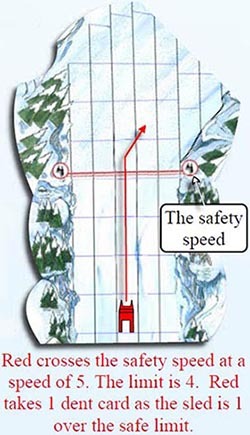 They then draw 1 dent card for each point of speed they were over the safety speed (e.g. travelling at speed 5 over a speed limit of 3 means you draw 2 dent cards). Remember, bonus movement for balanced sleds counts towards the sled's speed. The safety speed only applies as a sled crosses the line. The corner has no further speed restrictions. Slow in - fast out! If the sled has also had a collision later in the turn then this is now resolved. If not, the player moves to step 3 of their turn (return hand size to 5 cards). The player's turn ends immediately. The sled remains on the space it reached immediately before the collision occurred. The player does not refill his hand but does discard down to 5 cards if required (this may occur where a player has just taken a lot of dent cards on the same turn by going too fast through a corner). Remember, dent cards cannot be discarded. hand size. However, at the end of that turn, they still draw up to a hand size of 5 once they reach stage 3 (return hand size to 5 cards). A player is not obliged to avoid a crash and may do so for tactical reasons. Sleds are precision instruments. Throwing them into the side of the track severely disturbs their ability to move in the snow. May we also remind you th your insurance does not cover sled damage due to driver error. The sled's movement ends immediately. The sled remains on the space it reached immediately before the collision occurred. 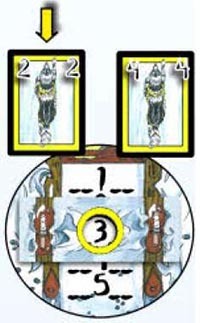 The player draws a dent card and then moves to step 3 of their turn (return hand size to 5 cards). A player is not obliged to avoid a crash and may do so for tactical reasons (for example, to avoid speeding through a corner). If a player is ever required to draw a 5th dent card then their sled is reduced to a pile of matchwood. They can travel no further on this sled. It is removed from the race. If, however, the sled has already crossed the finish line then the sled is left in the space it reached before it required to take the dent card. It can still win the race, although the driver might require some bandages. At the end of a round, all players who have crossed the finish line have finished the race. 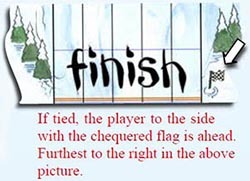 The player furthest passed the finish line wins the race and is considered first. This may differ from the player who crossed the finish line first. If the sleds are tied, then the sled to the side of the track nearest the chequered flag wins. Play then continues onto the next round, and so on, until all players have finished the race. You have read all this way wondering "what is the effect of the Big Paws Token" ? It is your reward for buying our game and teaching the game to others. Simply give it to the player who takes too long to think about their turn. Yellow is ahead and is therefore first to play. She plays a 2 onto her left dog. This gives her a speed of 3 (2+4-3), and a drift of two to the right (the right dog is pulling two stronger than the left dog). The sled travels three spaces forward and drifts twice to the right. 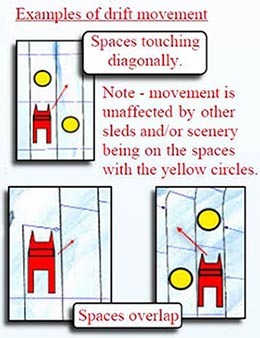 Yellow's sled is not travelling in excess of the safety limit for the corner, so she does not pick up any dent cards. Although blue and red are level, blue is on the inside for the next corner and therefore is in second. Blue plays a 2 onto each of his dogs and onto his brake (you are allowed to play more than one of the same value of card). This gives him a provisional speed of 2 (2+2-2), but he also has the option of a bonus for having a balanced sled (both dogs are the same value). The bonus is equal to his position (2nd = 2 ). He decides to take the bonus giving him a total speed of 4 with no drift. Red is last to go in the round. He places a 4 onto his left dog and uses another 4 for his brake. He is now travelling at speed 5 (4+5-4) with a drift of one to the right (the right dog is pulling one stronger than the left dog). Red takes exceeds the corner safety speed by 1 and takes one dent card. Here, red has a speed of 6 (3+5-2) and a drift of 2 to the right (the right dog is 2 stronger than the left). The player drifts twice by crossing the black lines twice. 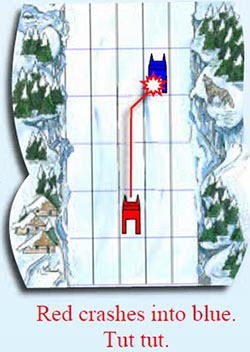 To execute drift, the player must cross a black line on the track.